Touch table lamps are popular for use as night lamps and desk lamps. The specialty about these lamps is that they activate by touch rather than by a push button or a mechanical switch. With multiple touches you can also adjust the brightness of the lamp. 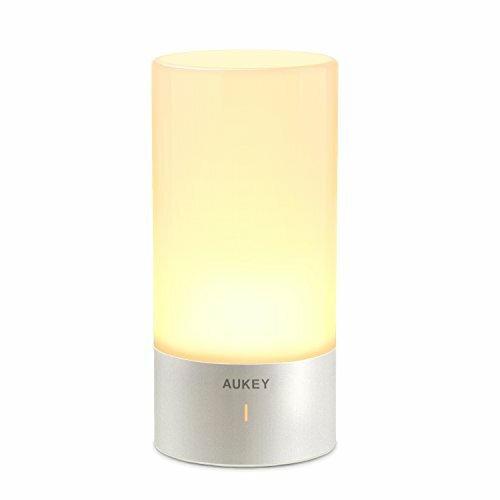 The first item on the best touch table lamp list is a table lamp by Aukey. This touch lamp is perfect for creating a soothing environment with its illumination. The light is bright enough to enable activities like reading to be done. 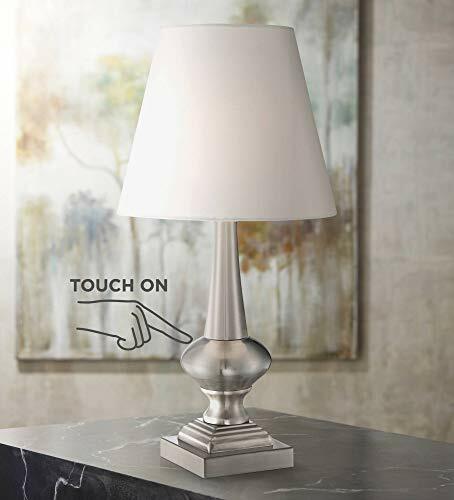 You can keep this touch lamp in hallways, living rooms or bedrooms. Depending on the environment and mood you are in you can change the lighting of the lamp which goes from vibrant to light colors. The adaptable modes allow for brightness levels to be controlled portraying a relaxing and cozy environment. This lamp comes with a 360-degree touch control base that assists in easily turning the lamp on and off. Customers who have purchased the touch table lamp have found the lighting to be excellent. The lamp provides a wide range of colors to allow the user to choose according to their need. They have also talked about the silicon ring that comes with the lamp and keeps it stationed on the surface. Overall customer review state that the lamp is sleek and well-built and the touch sensitivity is very much accurate. The second product on the best 3 way touch table lamps is the Hummingbird Desk Touch Lamp by Collections Etc. The best part about this lamp is that it comes with an elegant design. On the lamp, you will see a hummingbird motif and the overall structure of the lamp is delicate adding to its beauty. The glass panels come with a gold trim on the shade. The touch control comes with a choice of 3 way light settings giving you the authority to adjust according to what you require. The company provides a 60-day return policy along with a 100% satisfaction guarantee that the lamp is up to the mark. The company itself has been in this business for more than 50 years and provides quality based items that meet the functions for which they are designed. Customers who have purchased the item have found it to be an elegant lamp, nicely designed, perfect to double as a décor item. Customers found assembling the lamp very easy and have said that the touch system works well. If you wish to get a blend of beauty along with the required lighting this touch table lamp is a must-have. Another popular touch table lamp is a product by is by Ok Lighting. This touch lamp comes with a 40-watt bulb and has panels made of glass. The overall structure of the touch lamp is delicate and comes in the color white. The lamp uses an incandescent regular light bulb. It can be placed in different areas such as rooms, lounge or anywhere else. This item can also be used as a décor piece because of its design and structure. Customers who have purchased this touch table lamp have labeled it as a perfect lamp which is easy to assemble. Furthermore, the lamp’s overall design has been appreciated by customers who defined it as elegant. The touch settings work quite well-allowing lighting to be adjusted accordingly. This lamp is simple yet has an elegant touch to it. The structure of the lamp is a simple chrome base with a white open top, the shape of a cylinder. If you wish to create a more comfortable and relaxing ambience, this touch table lamp is a must have. This lamp comes with 4 different settings; you can adjust the lighting based on your need. The lamp has a UL-listed touch power source that makes the lamp safer to use and more durable. For people who are old, this lamp is a safe option to keep because of its ease of use. The light has a nice glow to it which means it won’t mess with your eyes. You can use this lamp as a nightstand lamp, bedside lamp, and table lamp and even place it in the living room. Customers who have used the product have stated that the lamp can give rise to a soothing ambience with its lighting settings. They have further added that the lamp is beautiful and sturdy, easy to use and has an overall appealing look. This table lamp by Revel also makes its place on the bestselling touch table lamps available on Amazon. The lamp comes with lighting systems that can be adjusted according to the requirement. Say no to tangle cords as this one allows you to easily turn on and off the lamp without any hassle. The dimensions of the lamp are 12.5″(H) x 5.5″ (W) x 5.5″ (L), Shade: 10.5″(H) x 5.5″ (W) x 5.5″ (L), Base: 1″(H) x 5.5″ (W) x 5.5″ (L). The lamp can be placed in any room and can give rise to a rejuvenating environment with its lighting settings. Customer reviews on this item state that the lamp is worth investing in. it is a high-quality product that is easy to assemble and fulfills all desired functions. The lamp comes with a cord that is long enough to allow it to be placed anywhere. Further, they have complimented the design of the lamp which they find appealing and elegant. With that, they have also mentioned the perfect size of the lamp allowing it to be placed in different areas. 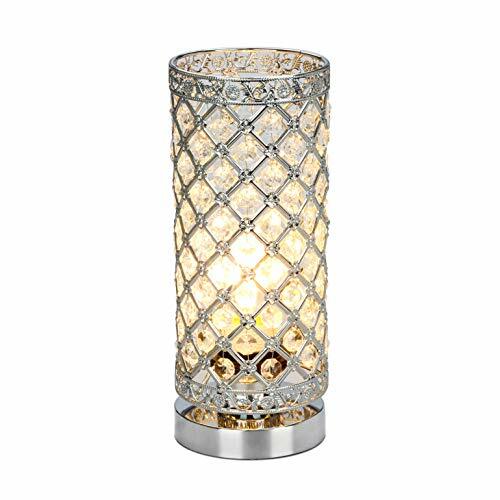 The Crystal table touch lamp by Seaside Village is also among the most popular touch table lamps. The structure of this lamp consists of a sturdy metal frame and a cylinder top. The lamp comes in 4 different settings giving the consumer the chance to keep the settings according to the need. The Ul listed touch power source makes the lamp safe to use and more durable. 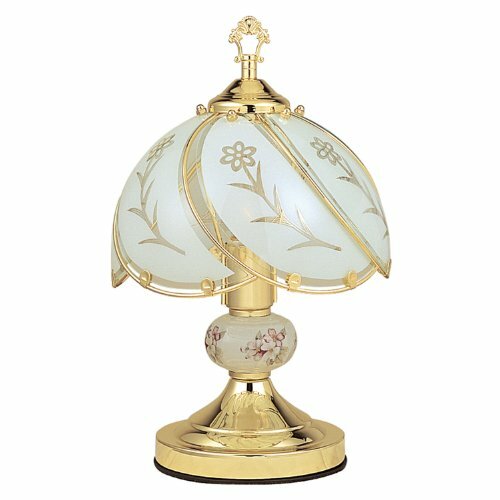 Use this lamp as a bedside lamp, nightstand lamp or a buffet lamp, the elegant design makes it perfect for use anywhere. For best results, the company recommends the use of incandescent bulbs if you wish to avoid flickering and dimming. Customers who have purchased this touch table lamp have described it as stylish, slightly bigger than the usual lamp size and appropriate for bedtime use. Further, they have talked about how easy it is to control the overall lighting of the lamp as the touch system is quite active. 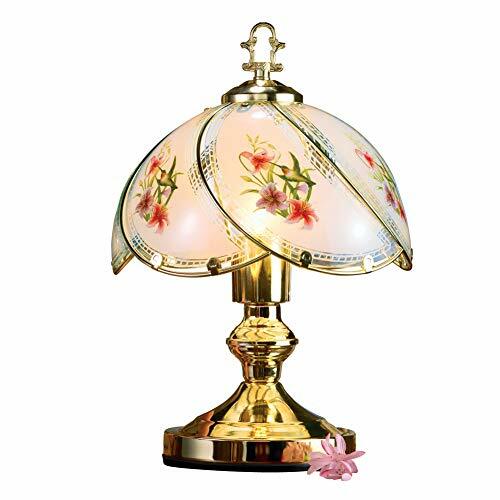 The lamp is very reasonably priced which is another plus point that customers have noted in their reviews. This touch control table lamp by Boncoo comes with high rating. This touch lamp comes with adjustable lighting options that for operation only require tapping. The lamp has a vintage touch and a unique design making it fall under the antique collection. If you are looking for a lamp that has a unique touch to it and meets the required function of serving as a touch lamp, this lamp is for you. The dimensions of the lamp are a 105mm/4.13in diameter, 72mm/2.83in high with a 59 Inch/1500mm. You can purchase the item to make your desk look more presentable and the lamp size makes it appropriate to be put on different tables. 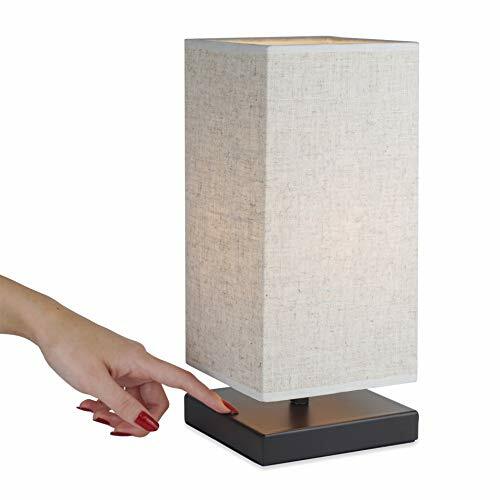 The best part is that this touch table lamp won’t do any damage to your furniture as it has a pad at the bottom to prevent scratches. Customers reviews regarding the product state that it is a lamp that compliments overall furniture décor of the house while at the same time serves the purpose of providing the lighting needed. The ease of adjusting the lighting simply by touching the base is another plus point of the lamp. This touch table lamp is portable, lightweight and uses LED technology. You can place it on your side table, office desk or any other table. Unlike bulky lamps that take up too much space, this is a perfect substitute. The lamp comes in adjustable settings allowing you to control the lighting according to your mood. This multifunction light setting can be adjusted to low, medium or high based on the need. The LED lights help save on energy and are safe, unlike other bulbs that consume a lot of energy. Another interesting feature of the table lamp is the color changing RGB lights that allow around 256 stunning colors to be displayed. Now you can have the lighting according to the mood you are in as this lamp allows you to do so. 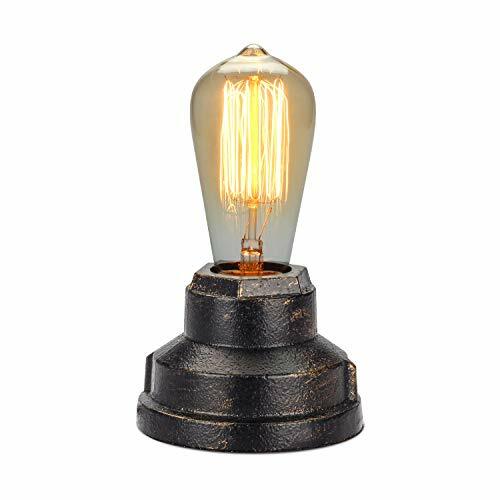 Customers reviews regarding the item state that unlike other lamps that are too bright and do not provide a comfortable ambience, this lamp goes easy on the eyes. The tap feature works well with this lamp allowing lighting to be easily adjusted. Despite having a small size the table lamp can effectively deliver and fulfill the functions, for which it was designed for. The dimensions of the lamp are 19″ high. Shade is 5 1/2″ across the top x 9 1/2″ across the bottom x 8″ high. The lamp comes with a 40-watt halogen bulb. To fix the lighting you simply have to touch the base. The option of low, medium, high and offsetting is available in this lamp. The lamp can be placed on your bedside table, office desk or any other side table. The structure of the lamp is made from metal and comes with a brushed steel finish. The lamp is available in a white shade and comes with a 6-foot long cord to allow the lamp to be placed anywhere. Customers who have purchased the lamp have found it to be quite useful. They have described it as a beautiful product that can double as a décor item because of its elegant design. 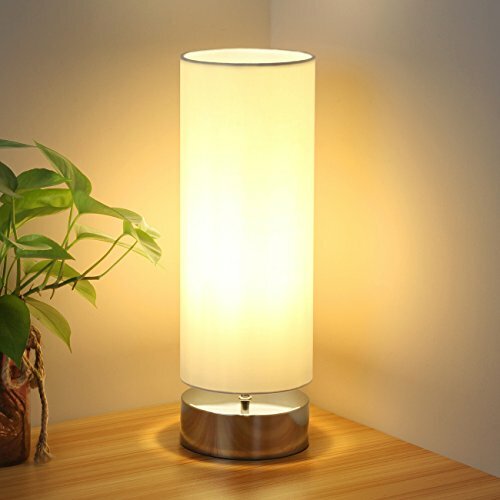 Customers have also mentioned how convenient the touch table lamp is for use by the elderly as its tapping features work well allowing automatic adjustment of the light. The lamp works great and can also be used to provide enough light allowing the user to read at night. The last lamp to be part of the best touch table lamps list is the touch lamp by Regency Hill. The overall dimensions of the lamp are 18 1/2″ high, round base is 5″ wide, shade is 5 1/2″ across the top x 9 1/2″ across the bottom x 8″. This lamp comes with a 60 Watt halogen bulb. This touch table lamp works perfectly well by tapping the base that allows for the lighting to be adjusted. 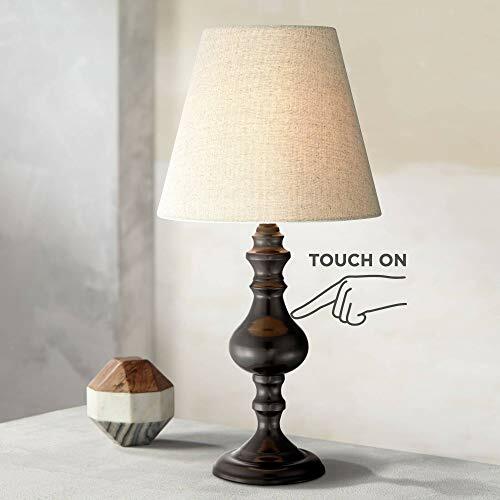 There are instructions as to how the lamp reacts to the touch so the first touch is for low light, the second for medium light and the third for high light. The fourth touch is an instruction for turning off the lamp. The lamp is made from bronze, metal constructed and comes in a beige shade with a 7-foot brown cord. This lamp can be used as a décor item because of its overall appealing look while at the same time as a bedside lamp or table lamp. Customers who have purchased the product have appreciated the overall structure and design of the lamp. They have talked about how the lamp provides the right amount of light. The lamps touch features work very well and allows it to be controlled without having to go through any hassle. Choose from these best touch table lamps to not only meet your home décor needs, but also to illuminate your room as per your preference. Whether it is a dim night light or a brighter reading light that you need, you can find a touch lamp to your expectation.